The mystery of where Malaysian Flight 370 went may soon be over, with current reports (and the Malaysian Prime Minister) suggesting that the plane diverted and crashed in the Indian Ocean with all passengers and crew presumed dead. A massive search operation, perhaps the largest in history, has led to Royal Australian Air Force (RAAF) planes finding wreckage in the Indian Ocean. While Malaysian Flight 370 has been (presumably) found, the events leading up to its disappearance on March 8 have caused many theories to spring up, from hijacking and pilot error, to the more unusual theory of aliens. In the wake of these theories, Van Buren students have come up with their own ideas of what truly happened in this mysterious story. Schumacker’s opinion is shared by several students. Drew Conner, junior, had his own take on the hijacking theory. “I think it was hijacked, diverted to China for a terrorist attack, and China had to shoot it down. Now, they don’t want to admit that they did it because of the potential consequences,” he theorized. However, satellite data seems to contradict this, pointing toward the jet crashing somewhere in the Indian Ocean and aircraft from the RAAF (Royal Australian Air Force) Base Pearce have found debris in the Indian Ocean. Several students think that the plane went down due to pilot or system error, including seniors Mac Williams, Jon Tobias, and Matthew Wilkins. 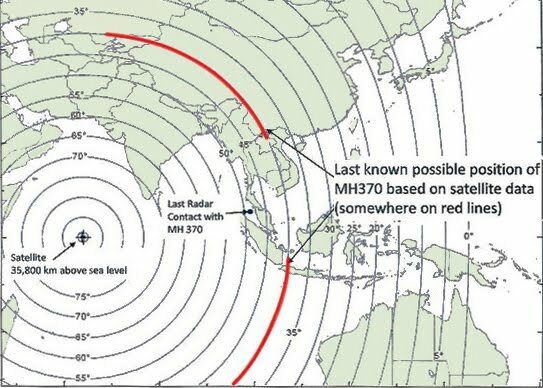 This theory is accepted by many, as it explains why the plane has gone off course into the Indian Ocean and stopped sending out routine transmitter signals, through instrument error. Though a mass failure of all of the flight’s transmitters is unlikely, it still remains a possibility. Some students are weary of the knowledge presented by the government officials involved. For example, the U.S. and China are hesitant to share information with each other, with both fearing that revealing too much will give insight into their own capabilities (or lack thereof). It’s difficult to imagine transparency between two competing nations in the region, and one flight won’t cause long-standing tensions to fall to the side. For the many families of the passengers of flight 370 that are awaiting the news of what the fate of the plane may have been, the new findings may be one step closer to resting this case. Although, nothing is final yet, so the search for answers and questions still reside.